Work has started on a new joint fire and police station in Maltby. 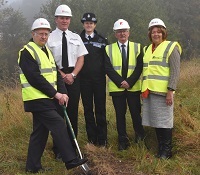 Chief Fire Officer James Courtney, Police & Crime Commissioner Dr Alan Billings, South Yorkshire Police Superintendent Sarah Poolman and Fire Authority member Cllr Pat Haith attended an event to formally begin work on the site. Maltby fire station will close and Maltby police station will be modified to accommodate fire service vehicles and staff, under the plans approved by Rotherham Council last year. The project won Government Transformation Funding of £560,000 and will help save both South Yorkshire Police and South Yorkshire Fire & Rescue money by sharing building running costs, enabling funding to be targeted at frontline services. The move will shift fire service resources around a mile closer to the east side of Rotherham, which traditionally accounts for a greater volume of emergency incidents compared to lower risk areas to the east of Maltby. It will also improve services by making it easier for police and firefighters to share knowledge, skills and expertise when tackling common issues, like anti-social behaviour and road traffic collisions. In a similar way, it will also help both organisations to reach the most vulnerable members of the community. Chief Fire Officer James Courtney said: “This move makes perfect sense for us, for the police and for the taxpayer. Instead of having two public buildings, and all the running costs associated with them, we will be able to combine our resources into one facility to provide a more efficient frontline service. Dr Alan Billings, South Yorkshire Police and Crime Commissioner said: “The move to accommodate both South Yorkshire Police and South Yorkshire Fire and Rescue staff under one roof is a huge step in our commitment to the public to reduce costs and work more collaboratively. South Yorkshire Police Superintendent Sarah Poolman said: “The layout of this purpose-built facility will assist internal information and intelligence sharing among police staff, as it’s better designed to help meet the demands of modern policing, demands that have changed substantially since the existing station was constructed many years ago on Main Street. Kier has been appointed as the main contractor for the building work and the new facility is expected to open in spring 2017. Last year the Government announced new proposals to transform the way the police, fire and rescue and ambulance services work together. It wants to encourage collaboration by introducing a new statutory duty on all three emergency services to look at opportunities to work with one another better to improve efficiency and effectiveness. Plans were announced earlier this year to create ambulance stand-by points at up to five fire stations in South Yorkshire The existing fire stations at Aston Park, Barnsley, Birley Moor, Edlington and Parkway will be modified to allow ambulance staff to share space in one of the first schemes of its kind in the country. A Local Intervention and Falls Episodes (LIFE) team has been also been set up in Sheffield which sees fire and police staff visit hundreds of homes in the city to reduce fire risk in properties, improve security and help people who have fallen and contribute to reducing the risk of falls.